This new multi-block linocut is a collaboration with Canal Poet Laureate Jo Bell. Both Jo's words and my design were developed separately, but came together quite well. A dear friend and talented member of The Guild, Robin Smithett, died on Friday morning, 15th Nov. Robin will be remembered as a kind and friendly member of The Guild. Always self deprecating of his work , he was an artist with his camera and the equal of any of us. Members who knew him will feel a keen sense of loss and extend our great sympathy to his wife, Margaret. Dear members and past members, it is with sadness that I have to pass on the news that one of our Founder Members, Harley Crossley, died two days ago. He had been ill for some time and died at home, aged 77 after some time in a hospice. I only met him a couple of times but admired his work very much, and he was such a nice man. He painted with oils, using a palette knife, working incredibly quickly; I remember having an exhibition stand opposite his at a National Rally - think it was the first Beale Park one; He would have his easel and paints out and would finish a painting in a morning - and probably sell it still wet that afternoon, then crack on with another one! His work was very sought after, but painterly too and very subtle in his use of colour. He often brought alive historical scenes from old post-cards. and a very nice person. It seems a long time now since a few of us all sat around after one of the Stoke Bruerne Artists' Weekends and floated the idea of forming a Guild of Waterway Artists. Harley was one of the regular exhibitors. He was always conspicuous on those occasions by the groups of people standing around him or frequently returning to view progress as a new image grew before their eyes. Without doubt he was a wizard with a knife, and readily conveyed his thoughts on what he was producing to those watching him work. He never failed to amaze me, anyway! His other speciality as I recall was Ocean Liners, handled in the same way as his other paintings. The Guild grew, new and different venues were attended and membership changed, bringing a greater diversity of art to a wider audience. 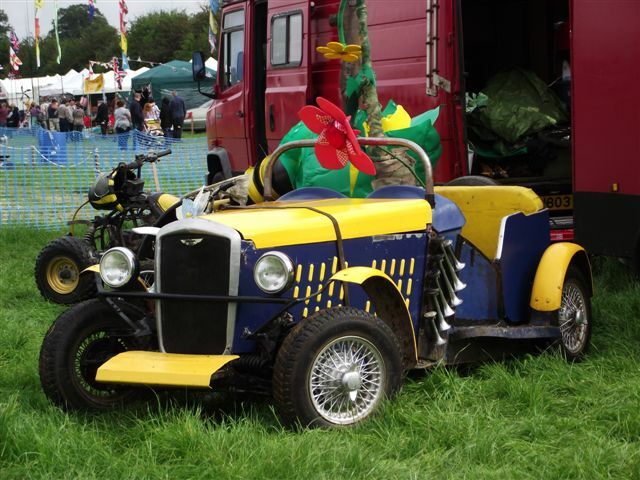 At most of the events where artists were invited, the familiar campervan would appear, Harley would "do his bit" and then be off elsewhere to gain more ideas or to attend another show. He will be remembered by many. The waterways have changed and a lot of water has gone under the bridge. Since those early days that led to the forming of the Guild, a lot of paint will have gone under Harley's knife. His legacy hangs on many a wall and in the minds of those who knew him . What sad news. Obviously I never knew him, but have just had a look at his work on a number of sites. Although his particular figurative style is not my cup of tea - what a wonderful technician, he really knew how to paint didn't he. Shame he as gone, but his hard work means we should try all the harder to keep, what he initiated, going. I am so sorry to hear about Harley. He used to come to Braunston to exhibit regularly when I organised the exhibitions at the Stop House and he was an amazing painter. As Sarah has said he could whip up a painting in literally an hour or so and it would be masterly. He did one once for us of The Stop House and I watched as he did it. I believe it is still there hanging in the office. He was a lovely man and interesting to talk to but his paintings appealed around the world so it was natural he would move on from the Guild. We were lucky to have him as a founder. Very sad news to hear of the passing of one of the Guilds founders. What a wonderful body of work he has us left to remember him by. Just got back from a long awaited holiday on Laura. 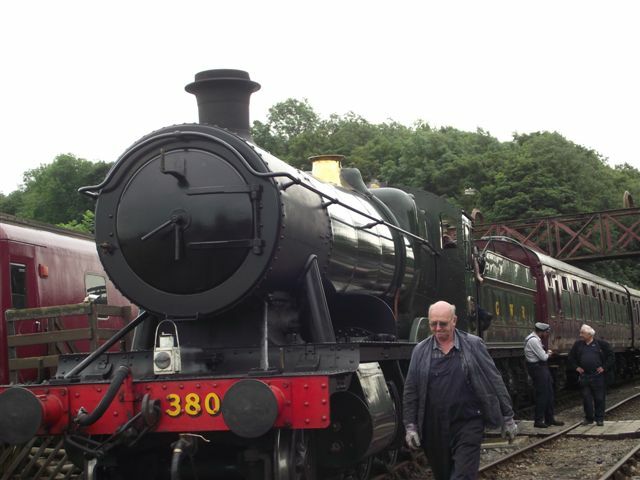 We went to Shackerstone's Family weekend celebrations which took in The Battlefield Line train where we went in to the old Victorian cafe on the platform and had a lovely tea with cake. It was a great weekend The celebrations were held in a vast field which had attractions of old vintage cars motorbikes and curious machines sort of like go carts but based on old lawn mowers, absoluteley wonderful especially when they raced them round the circut with some real characters at the helm. There were real Chariots of Fire, horse drawn chariots taking them between burning obstacles. There were rides for the kids with a large fairground and donkeys, and birds of prey being put through their paces (captive bred). 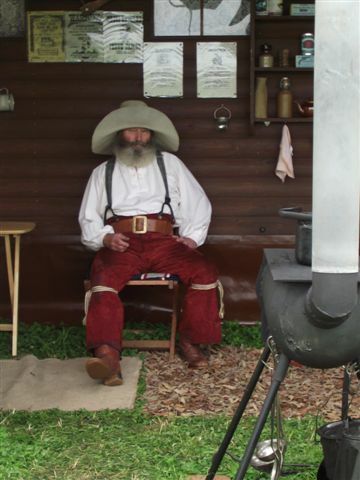 One of the attractions was old log cabins with people dressed as American pioneers with their open fires billy cans furs and rifles. I think they were the Lincoln County Reulators Wild West Show and had a shoot out at the OK CANAL . The Adrenaline Tour with speed motorised stunt action on two and four wheels. The army was there with enthusiasts showing past vehicles which George was very interested in (and driven). 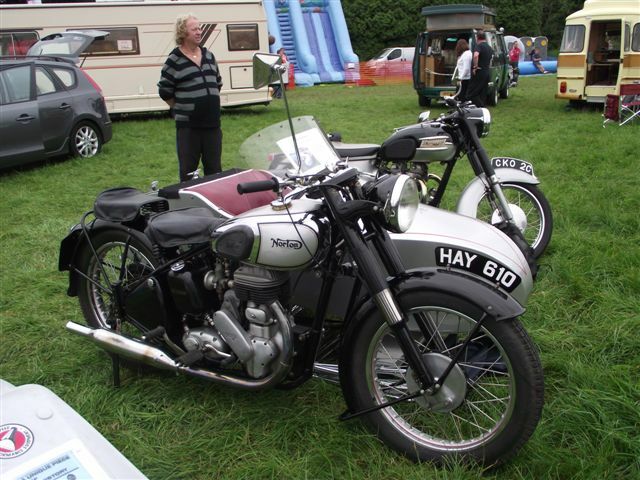 I loved the motor bikes especially as my father had a Norton, and a BSA. Also there was Bob Hoggs duck herding and sheep racing, and Dingle Fingle & the clown town crimewatch. 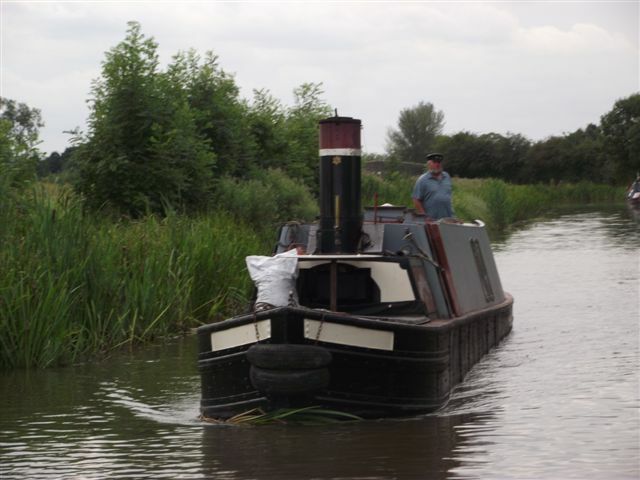 We travelled with another couple, who usually go to these things with us on on our Brummagem Tug "Laura"and they on their Tug "Storm". Janul is a minstrel and a story teller. There were a good range of stalls however only one had anything boatie, shackles nuts and bolts and a bit of old stuff. There were lots of food vendors, and The Ashby Canal Association had a stall. A bit of Canalware a couple of antique tents, plant stall, sweets, jewelry and a craft tent of course . 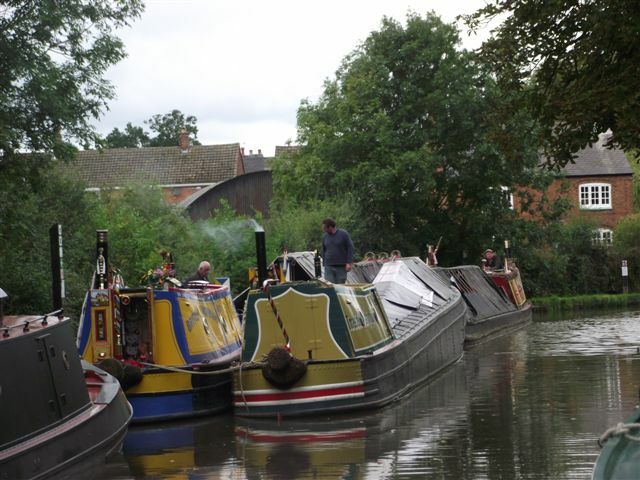 A lot of Historic Narrowboats were there, all the old crowd but not Kildare and President. It was a Loveley atmosphere and the weather was kind. It attaracted a huge crowd and was a good show.They even had a fly past of wartime planes for the Battle of Britain Memorial Flight which was a thrill. A Beer festival, Natural Horsemanship Demonstration and Clinic, Steel Bands and a Battle of Marching Bands and miniature train rides. 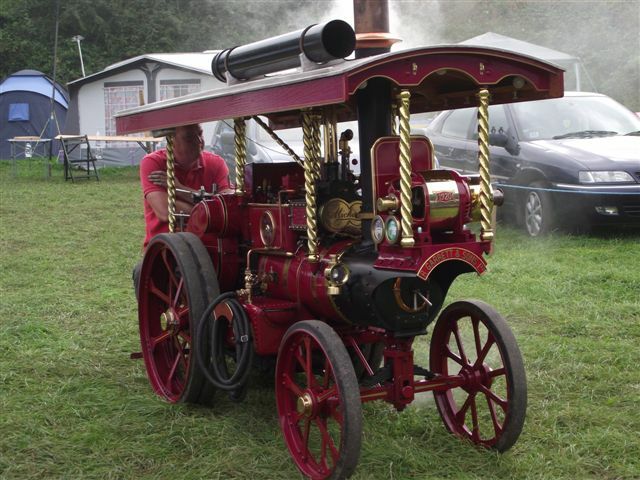 Superb traction engines lovingly restored and working. I think people came from a long way for the show and most enjoyed it immensley, a good weekend not to be missed next year.